Oh, the honeyed gravitas. Languid and relaxed. Soothing and warm. There’s that dominant, strong male sound, with a nice low pitch, but it’s grounded and non-threatening. 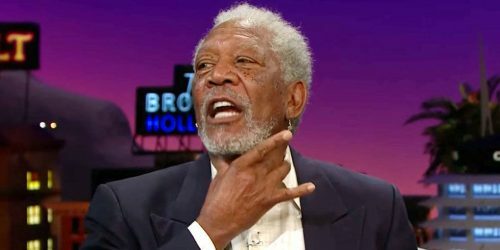 When Morgan Freeman does voiceover you feel like you’re in good hands, er…tones. We can’t get enough. And neither can our clients. Ever wondered why? Casey Klofstad did. He’s an associate professor of political science at the University of Miami. A year or so ago he conducted a study involving political ads. He found kind of what you instinctively already knew. Lower-voiced individuals (like Morgan Freeman but this apparently applies to both male and female voices) give us the impression of integrity, competence and physical power. Except for an early stint in the air force, Morgan’s been an actor most of his life. He did his first credited voice over for the documentary, The Civil War, in 1990. Since then he’s done countless documentaries including American Masters and the March of the Penguins. I don’t know about you, but the movie that made me sit up and take notice was probably Shawshank Redemption, where the casting director and director wisely departed from the written character of an Irishman for Red gave the role to Freeman. We’ve seen him in A Raisin in the Sun and Driving Miss Daisy. His winning Oscar was for Million Dollar Baby, but he was nominated in several others. We loved him as God in Bruce Almighty. Since then we’ve heard him replace Walter Cronkite’s voice for the intro to CBS news (2010), narrate the summer Olympics and announce for campaign for Hilary Clinton’s campaign. He’s done a few VO’s for commercials, gaming and has become so iconic, his likeness has been on everything from South Park to a character in Drawception, a Pictionary/Broken Telephone sort of game where he’s been morphed into Godzilla. Morganzilla. Happily, not one to take himself too seriously, he also pokes fun at the art of narration in a gentle loving way. As a deity would. 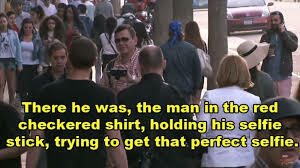 Jimmy Kimmel thought asking Freeman to narrate a random fellow caught on camera with a selfie stick would be good entertainment and it was brilliant. 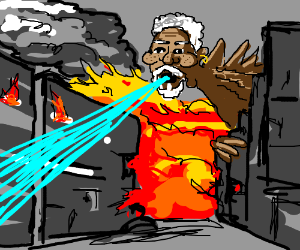 Everyone’s life would probably be more interesting with Morgan Freeman narrating it. Mark Zuckerburg thought so. Or thought a variation of that would be interesting. So he asked Freeman to be the voice featured on Jarvis, Zuckerberg’s artificial intelligence assistant. He also licensed his voice to Waze to coincide with the release of the film London has Fallen. Analyzing the why of our love for his sound, some people have said it’s familiar, as in we’ve heard it on so many things. But Morgan doesn’t risk over exposure. Actually, that’s one of the benefits of voice acting. Your sound doesn’t burn as quickly as your face. Or so they say. Others point out that nice maple rich tone. Still others say it’s his confidence. Confident people don’t shout and rail. They don’t have to. They speak low and quiet. I think it has a lot to do with his delivery. When the stakes are raised, he comes across as passionate, but it’s contained. Even his intensity is relaxed. Intimate. Like he’s sitting next to you in your living room. Or better yet, the back porch. Arms stretched out on either side. Gazing at the countryside while he spins his tale. Stephan Allard. a Quebec actor I often work with played him once for a dubbed version of an ad for Bailey’s Irish Cream. Guy Nadon, another actor in my hometown has dubbed Morgan Freeman 23 times, in French for the Quebec market. About this, Nadon says it’s not so much about the voice as that he heavily leans on Freeman’s attitude and performance. If you really want to get your own Morgan on, don’t try to sound just like him. But do take cues from him. He’s unique. Yes, but so are you. No one has your voice or your delivery. He’s confident. Damn straight. So why shouldn’t you be? No one can be or deliver like you, better than you. He’s comfortable. This is technique and head space. Your head must be in a good space, before you can project this. A director friend of mine once said of her impression in working with Robert Redford, “The man is just so comfortable in his own skin.” My notion on where that comes from? Introspection. It’s a mindset. Call it the Morgan mindset, if you want. A sucker for corny humor and pitiful puns, one of my fav Morgan Freeman quotes is, “I gravitate toward gravitas.” I also love about him that his concern for the honeybee decline led him to hobby beekeeping with 24 hives. But my favorite sentiment from Freeman is his controversial statement about Black Month history. Anyone who puts forth a platform of erasing lines of difference in status between us because of race or color has my vote. Whether we’re voting for Voice of God or godzilla. I’m a female voice actor who’s tapped into my inner Morgan Freeman for everything from documentaries to web commercials. 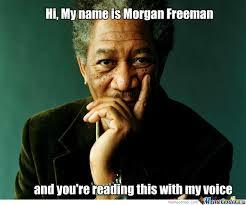 What’s your favorite Morgan Freeman VO? My favorite Morgan Freeman VO was when he took helium on the Tonight Show. It was hilarious! Great article Kim! Thanks Susan. Oh my gosh! Now I have to look that one up!